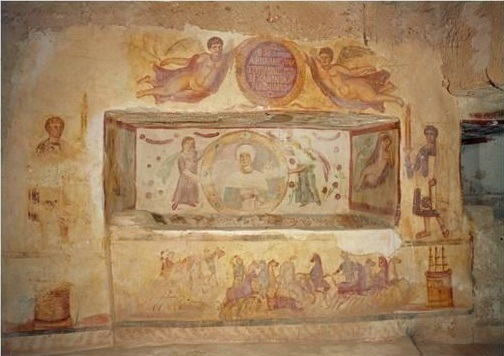 CIMRM 113-115 - Tomb of Aelia Arisuth. Tripoli, Libya. 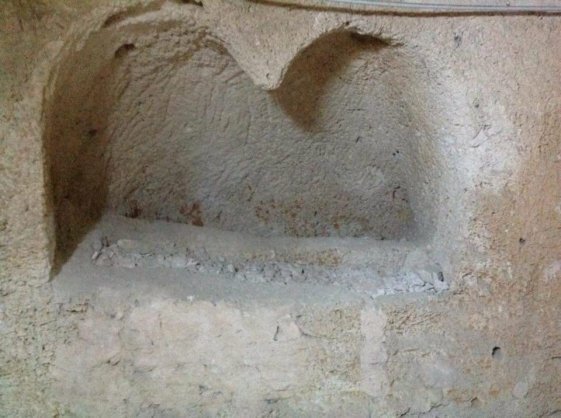 Tomb-niche of Aelia Arisuth, left figure damaged. 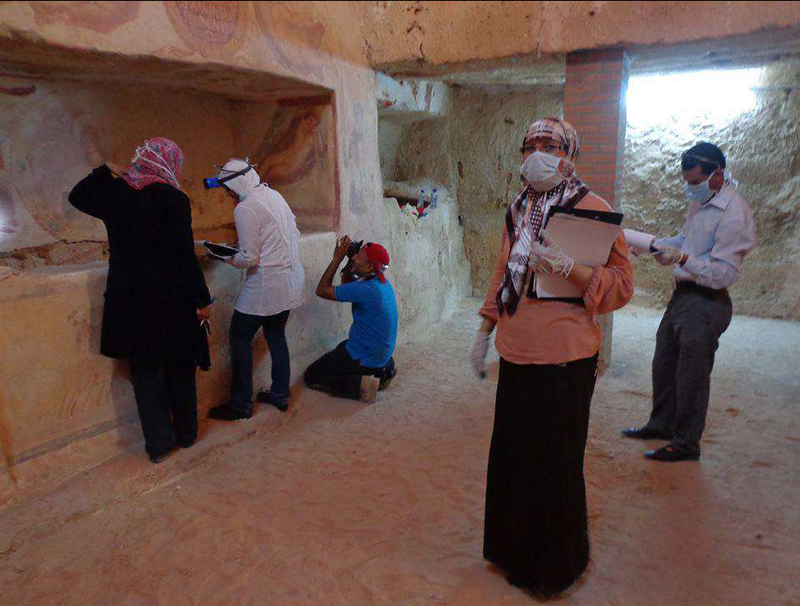 From: The current situation of the archeological heritage in Libya: The efforts of the D.O.A with regional and the international partners, UNESCO slide show. 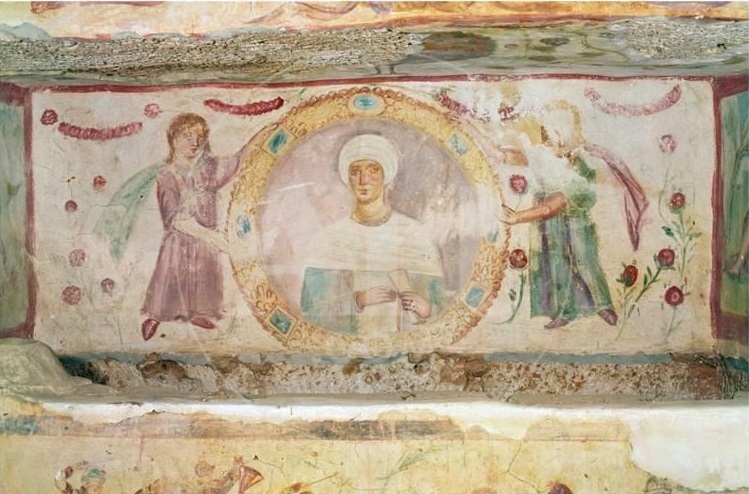 2013 restoration work on niche, via UNESCO slides. Zoomed portrait in the niche. Via Art.com. Hisham Tabib, 28 Feb 2018. Detail of the second niche, for Aelius Magnus. From De Marre. 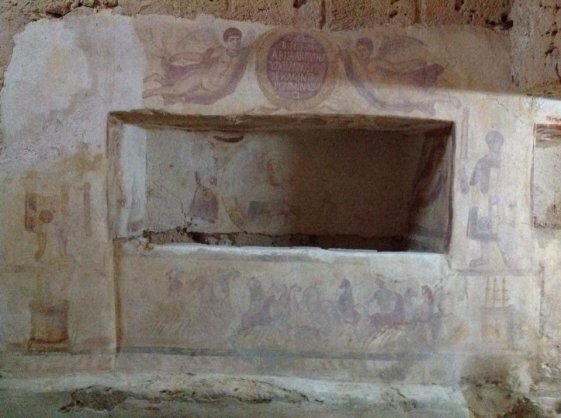 Outside Tripoli is the tomb of Aelia Arisuth and her husband, Aelius Magnus. This seems to have suffered damage during the Libyan revolution: the head of the left-most figure has been removed. 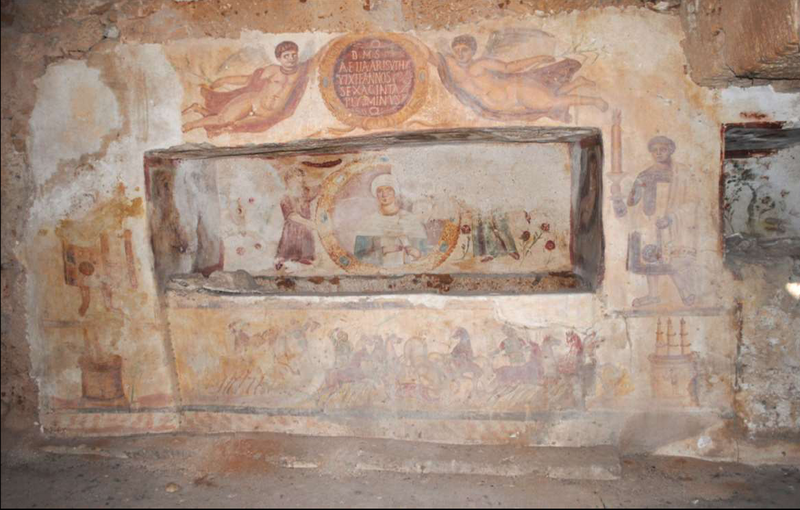 I have not been able to find any other images of the tomb niche of Aelius Magnus. Two sepulchral vaults hewn out in the rock side by side at Guigariche, 7 k.m. west of Tripoli. Clermont-Ganneau in CRAI 1903, 357 ff with fig. ; cf. AA 1904, 117 with fig. ; AJA 1904, 124f. 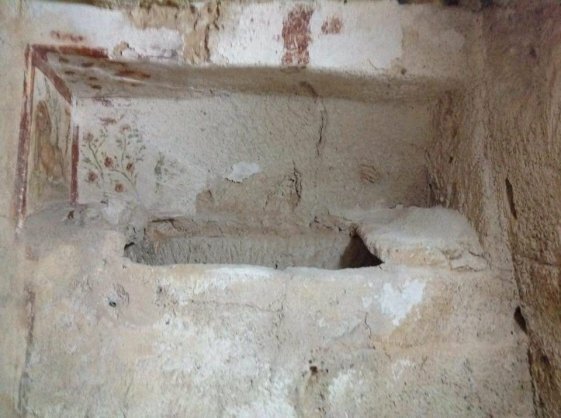 In one of the walls there is a niche in which the tomb. 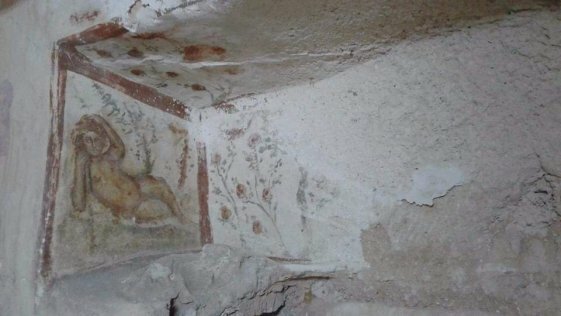 The niche is completely painted over as well as the adjoining walls. 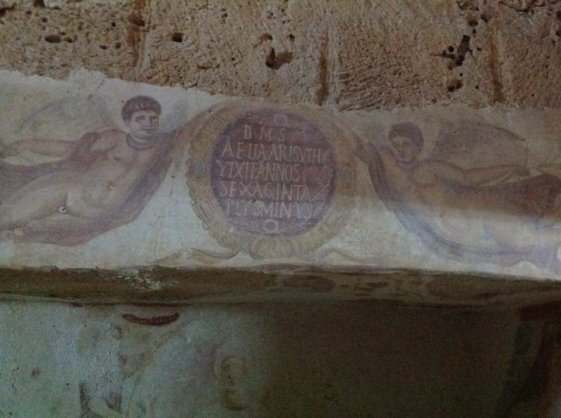 On its back-wall a dead person is represented. Dressed in an expensive tunic, he lies down amongst flowers and trees. On the sidewalls of the niche, on either side, a painted naked genius, putting their hands up to their faces in mourning. 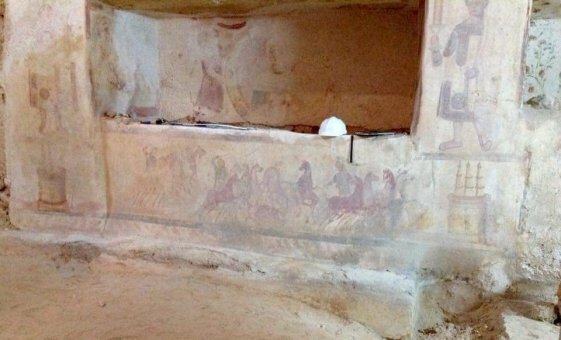 On the front-side of the tomb a scene, of which only a standing person with outstretched arm has been preserved. 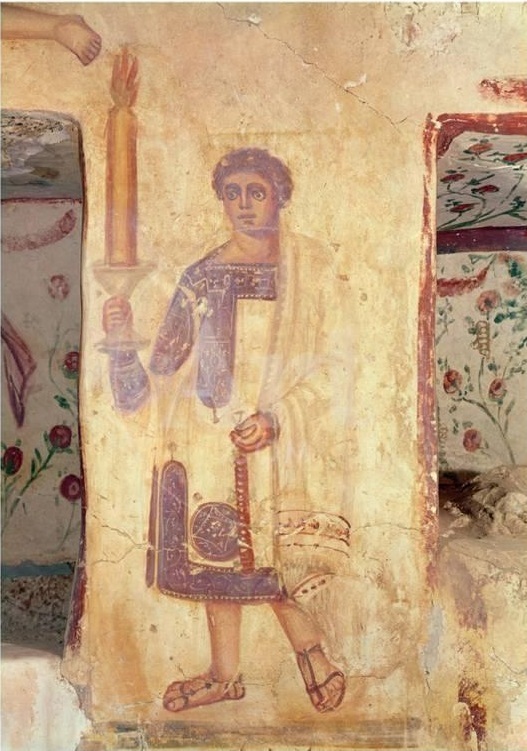 Next to the niche on the left sidewall, a walking person in long garment with a raised candle-stick in his r.h. Above the niche, between two peacocks and in a tabula ansata an inscription (No. 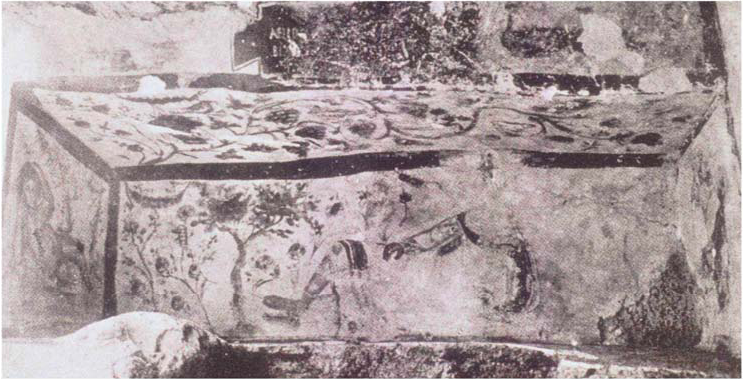 114), which is continued on the cover of the tomb, on which moreover a leaping lion is represented. 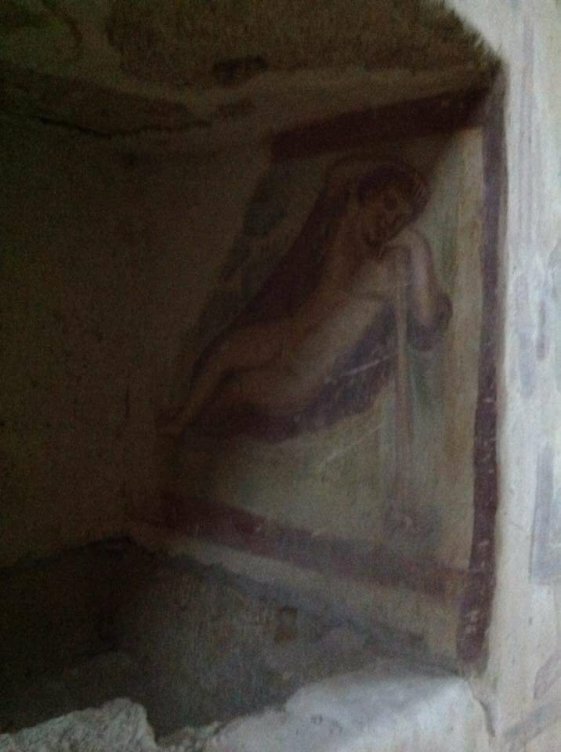 In the other room, also with niche and tomb, the frescoes are better preserved. On the backwall of the niche, the bust of the deceased woman is depicted in a medallion supported on either side by a woman. In her l.h. she holds a scroll, the other hand she presses against her breast. The whole in a yellow frame: On the sidewalls of the niche, two naked mourning persons are lying stretched out on a red cloth. On the walls next to the niche on either side a walking person with short head-dress and dressed in a richly adorned tunic. They hold a candle-stick in their hands. Above the niche in a wreath carried by two genii with blue wings and in red, flying garments, an inscription (No. 115) which is continued in red characters on the body of a lioness, which has been represented on the cover of the tomb. On the tomb itself a race between several quadrigae in the circus is shown. Aelius Ma[gn]us Iuratani (filius) / bixit annus ..... / plus mi(nus). On the cover of the tomb: [qu]i leo iacet. D(is) M(anibus) s(acrum) / Aelia Arisuth / vixit annus / sexaginta plus minus. On the cover of the tomb: quae lea iacet. This might be the grave of a mithraist with the hierarchic grade of a Lion; cf. a representation of a Lion with candle-stick in the Mithraeum of S. Prisca's at Rome (No. 482,6). But then it is very strange, that this sect should have accepted women as well. Cf. a similar find from Artanada (Lycaonia) in Sterrett, Am. Papers, III, No 153; MMM II No 550. Martine De Marre, "Aelia Arisuth - Mithraic Matron or Popular Patron", In: William Henderson and Effrosyni Zacharopoulou, Greece, Rome, Byzantium and Africa. Studies presented to Benjamin Hendrickx on his seventy-fifth birthday, Herodotus (2016), pp.215-239. Chapter 9. Australian site with monochrome images.